A film process that uses color film to produce three-color positive pictures. grains or resin particles (with diameters of approximately 0.01 mm) positioned between a glass plate or film support and a light-sensitive layer. When a subject is photographed from the glass side, the colored elements of the screen serve as microscopic, color-separating light filters; conversely, they serve as color-reproduction elements in the positive images obtained by reversal. The first screen materials, called autochrome plates, were produced in 1907 by the French firm Lumière. However, because of poor resolution, insufficient image brightness, and great technical difficulties in copying, screen color photography was rendered obsolete in the 1930’s, primarily by methods based on the subtractive principle of color synthesis. In subtractive synthesis the same principle of three-band color separation is used, but color reproduction is achieved by subtraction of the primary colors from white light. Subtraction is usually achieved by combining various amounts of dyes of the complementary colors yellow, magenta, and cyan on a white or transparent support. Thus, the combination of magenta and cyan dyes produces blue (magenta subtracts green from white light, and cyan subtracts red), the combination of yellow and magenta dyes produces red, and the combination of cyan and yellow dyes produces green; the combination of equal amounts of all three dyes produces black. 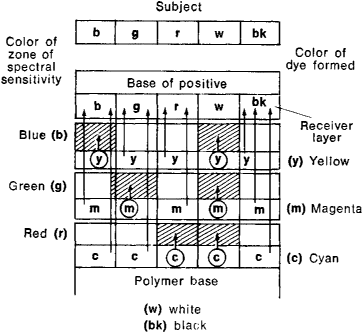 Subtractive color synthesis was first achieved in 1868–69 by the French inventor L. Ducos du Hauron, who obtained a color image by means of a pigment process (seePIGMENT PAPER). In this method, as in other early subtractive methods (the carbro, imbibition Duxachrome, and chromatone processes), partial positive images were printed from three color-separated negatives obtained by exposure through blue, green, and red filters; the positives were dyed or pigmented yellow, magenta, and cyan, respectively, and a color image was produced by superimposing the positives in register. Subtractive processes with multilayer color materials are the most commonly used techniques in modern amateur and professional still and motion-picture photography and color printing. The first multilayer color materials were produced by the American firm Eastman Kodak in 1935 and the German firm Agfa in 1938; they used reversal processing. Color separation is achieved in multilayer color film materials through the selective absorption of the primary colors by three silver halide light-sensitive layers coated on a single support, or base (see Figure 1). The color image is formed by organic dyes as a result of color development, which is based on the work of the Austrian chemist B. Homolka (1907) and the German chemist R. Fischer (1912). Color separation in multilayer color materials is possible because the upper layer of emulsion does not contain sensitizers and thus is sensitive only to the blue portion of the visible spectrum (seeSENSITIZATION, OPTICAL), the middle layer is sensitized to the green portion, and the bottom layer is sensitized to the red portion. A yellow light filter (an organic dye or sol of metallic silver in gelatin) is placed between the upper and middle layers to prevent the action of blue light on the silver halide in the middle and bottom layers. This structure of multilayer color materials provides for the formation of a latent photographic image of the corresponding third of the visible spectrum in each of the three emulsion layers. Color development is achieved with special developing agents, which are usually derivatives of p-phenylenediamine, mainly, N,N-diethyl-p-phenylenediamine sulfate (C2H5)2NC6H4NH2H2SO4 and N-hydroxyethyl-N-ethyl-p-phenylenediamine sulfate (HOC2H4)N(C2H5)C6H4NH2·H2SO4. These compounds, in contradistinction to black-and-white developers, not only convert silver halide to metallic silver, but in their oxidized form (produced as a result of their reduction of silver halide) they also act with couplers in the emulsion layers to form organic dyes. The basic principle of subtractive color reproduction requires that the color of the partial images be complementary to the color of the light selectively absorbed during exposure by the light-sensitive layers of the color material. Therefore, the couplers are selected such that a yellow dye is formed in the upper, blue-sensitive layer; a magenta dye is formed in the middle, green-sensitive layer; and a cyan dye is formed in the bottom, red-sensitive layer. Certain substituted (β-ketones, acylacetic acids, and heterocyclic ketones may be used as the couplers that form yellow azomethine dyes. Derivatives of heterocyclic compounds (pyrazolone, coumarone, and thionaphthenone) and aromatic compounds, such as p-nitrobenzyl cyanide and benzoyl acetonitrile, are used to form magenta dyes. Cyan indoaniline dyes are formed from such couplers as benzene and naphthalene derivatives (mainly, α-naphthol and hydroxydiphenyls) and some heterocyclic compounds, such as 8-hydroxyquinoline. Long-chain alkyl groups or residues of higher fatty acids with 12–18 carbon atoms are introduced into the coupler molecules in order to prevent coupler diffusion into adjacent layers of the multilayer color material. The fixation of a coupler in its corresponding layer may also be accomplished by other methods, such as dissolving the coupler in triphenyl phosphate, tricresyl phosphate, or some other solvent with low volatility, with subsequent dispersion of the solution obtained in the emulsion before the emulsion is coated on the support. Other processes are also used with multilayer color materials to produce color images (with reversal) in direct positive and negative-positive color photography. Exposed multilayer reversal materials (seeREVERSAL) are processed initially in an ordinary black-and-white developer containing hydroquinone (with Phenidone) as the developing agent, which forms three color-separated negative images of metallic silver in the emulsion layers. The material is then illuminated without fixing. The residual silver halide and the color developer produce partial positive images consisting of a mixture of metallic silver with an organic dye of the corresponding color in all three emulsion layers. The developed metallic silver and the silver in the filter and antihalation layers are then bleached with potassium ferricyanide and potassium bromide, and the material is fixed, washed, and dried. Pure color images, constituting partial, monocolor positives, remain in the emulsion layers and may be combined to produce the required colors in all sections of the color material. In some methods of direct positive color photography (for example, in the Eastman Kodak method mentioned above), the color components are introduced into the color developers rather than the emulsion layers of the multilayer color material. Although the images obtained by such methods have high-quality color reproduction, they have not been widely used, because of the complexity of processing—for example, the need for separate illumination and color developing for each layer. In the negative-positive method of color photography using multilayer color materials (first achieved by Agfa in 1939), the exposed material undergoes color development (rather than black-and-white development) in the first stage of processing, which produces three color-separated negative images formed by yellow, magenta, and cyan dyes. However, since all the colors of the subject in each layer of the negative are replaced by complementary colors, the image produced is also colored by complementary colors; for example, a green forest in a color negative appears magenta, and a cyan sky appears yellow. A positive image is produced by printing on a light-sensitive material similar in structure to the color negative. Thus, all the colors in the positive acquire a normal appearance. Color negatives are also commonly used in various methods of color printing for producing three color-separated, three-dimensional images, or matrices. The images are correspondingly colored or pigmented, and the dye or pigment is then transferred sequentially onto a single support (see IMBIBITION PROCESS and LITHOGRAPHY). In the 1960’s the American firm of Polaroid Corporation also introduced a color variant of the black-and-white process that uses diffusion image transfer, which produces a single color positive on paper (often called instant photography). 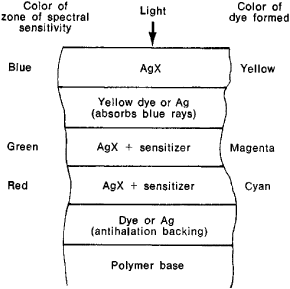 The process is based on three-zone color separation using a multilayer color film that differs from ordinary films (such as those used in reversal processes) in that each of the three primary gelatin layers (see Figure 2) is divided into an upper, light-sensitive sublayer containing silver halides and a lower layer of a color complementary to the color of the zonal sensitivity of the upper sublayer (that is, yellow, magenta, or cyan). Each dye molecule has what is known as a developer group (for example, a hydroquinone group), which imparts the capacity to diffuse in an alkaline medium to the corresponding upper sublayer and to develop the latent color-separated photographic image in the sublayer. When oxidized during development, the dyes lose their capacity to diffuse and remain in their original sublayers. The residual, unchanged dyes continue diffusing and reach the receiver gelatin layer of a paper placed in contact with the color film, where a postive color image of the subject is produced by the subtractive principle. Ordinary color photography is designed to achieve the most nearly correct reproduction of all the real colors of a subject. In addition to such techniques, space photography and aerial photographic surveys of natural objects commonly use two-layer and three-layer films with specific zonal spectral sensitivities; the emulsions of such films often include a layer sensitive to infrared radiation. When such color materials are exposed, only individual zones of the spectral region of the light reflected from the subject are recorded. As a result, the colors are transmitted with some given distortion, which permits a clearer rendering of details that are difficult to differentiate under natural conditions. The Lippmann process, developed in 1891 by G. Lippmann, is a special type of color photography, which was a unique precursor of holography. Mertts, K. L. Tsvetnaia fotografiia. Moscow, 1949. Chel’tsov, V. S., and S. A. Bongard. Tsvetnoe proiavlenie trekhsloinykh svetochuvstvitel’nykh materialov. Moscow, 1958. Artiushin, L. F. Osnovy vosproizvedeniia tsveta v fotografii, kino, poligrafo. Moscow, 1970. What seems strange to me is that in spite of there having been very many photographs taken of the Tyne Bridge and its neighbouring bridges, the earliest colour photograph I can find is from 1965. Does anyone have colour photographs of the Tyne Bridge from before it was painted blue, or of the Swing Bridge in green or earlier colour schemes? The technology that FotoMagic showcased could print colour photographs onto a crystalline surface at affordable costs, starting from as low as RO5. Vertically hung spot-lit colour photographs signal the displays at each table.